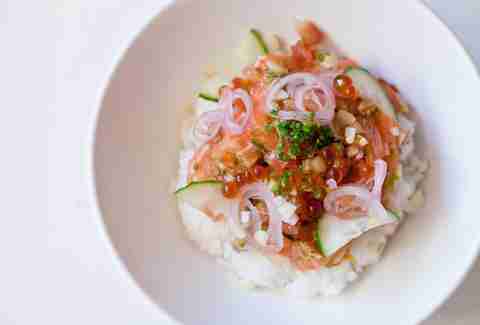 It’s hard to believe how many poké spots opened up last year, when the diced-fish trend first swam over from Hawaii -- and it’s even HARDER to believe how many more have opened up since then. There are so many in LA, it’s hard to figure out which ones are worth your time. But we did it, mercury poisoning be damned! 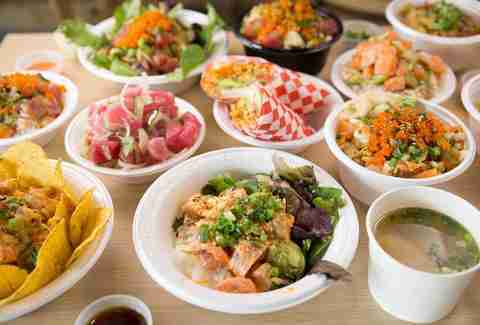 Here are our picks for the 13 best poké shops in LA -- and their best specialty bowls, when applicable. The newest spot in the #pokexplosion is like a big friendly hug. They somehow have a free parking lot in the middle of Hollywood, the space is huge, and they offer out-there options like octopus and scallops, everything comes with a monstrously delicious sweet citrus sauce, and they’ve got creative toppings like daikon sprouts, chili flakes, and jicama. Get over there soon before everybody figures them out and the line inevitably shoots out the door. 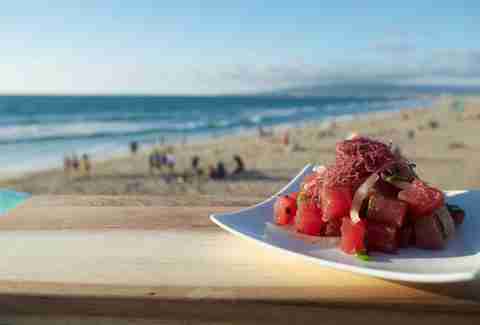 If you’re a poké fiend, you’re gonna want to say aloha to Roy Choi’s Hawaiian Culver City spot. Grab some poké of the day for $15, or try a poké sampler for $16 (including choices like tuna with gochujang sauce, sesame leaves & oil, cabbage, seaweed, and nori, as well as tuna with kukui nut chili pesto and Parmesan). Or grab both, and wash ‘em down with some tangy Hawaiian cocktails like “Missionary’s Return,” with Beefeater gin, lemon, honey, pineapple, apricot, and mint. Roy Choi is a poké wizard. 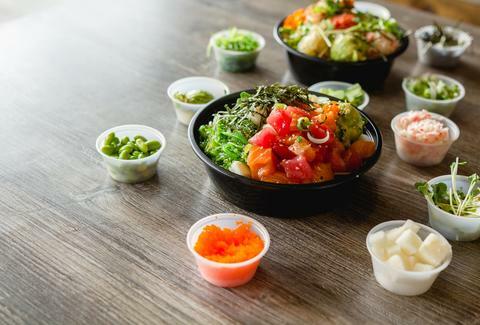 At Wiki Poke, for under $10, you can build your own bowl with as many toppings as you want for no additional charge, plus two sides (including spicy edamame). Wiki also tries to focus on the food’s Hawaiian roots, with specialty Hawaiian drinks also on the menu. Unlike many competitors, the fledgling mini-chain Ohana doesn’t have much interest in serving you the standard tuna/salmon/albacore options -- though you can get those, you can also get harder-to-find options like Korean octopus and garlic prawns, or vegan options like soy ginger tofu. These fine customized-bowl-only Brand Ave poké champions rise above thanks to a ton of not-so-traditional toppings like pickled red radish, soba noodles, and six different sauce options, with no limit to the options you can add on for $10 or $12 for a regular or large bowl. While you can build your own bowl at Spinfish, you can take the pressure off yourself and go with one of their incredible signature bowls -- like the Caribbean bowl with hamachi and mango salsa, or the Aloha 808 with ogo limu (a type of Hawaiian seaweed), Hawaiian sea salt, chili flakes, green & sweet onions. 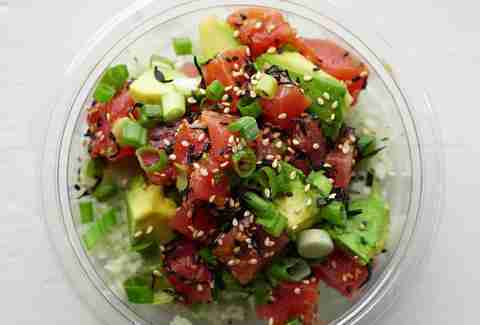 The fine human beings over at North Shore Poke Co. feel strongly that poké doesn’t need to come in a bowl: they’ve got poké tacos, poké nachos, and even SASHIMI SANDWICHES ON LA BREA BREAD, which is obviously an idea for the ages. There’s absolutely no customization at this DTLA spot, so if you have a hard time picking things for yourself have no fear: get an Okipoki 101 full of tuna, avocado, seaweed salad, wasabi tobiko, and pickled kombu or a Truffle Trouble full of salmon, mushrooms, avocado, cucumber, pickled shallots, masago and ginger scallion truffle sauce. Also? They’ll make it a burrito for you. Seriously. Any old shop can offer tuna and salmon. Mainland offers toro and salmon belly. Any old shop can offer sea salt. Mainland offers red alaea salt. Any old shop can offer shoyu and soy sauce. Mainland offers Sriracha aioli and coconut sauce. And once you dive into their “Ichiban” with albacore, pickled ginger, green onions, tobiko, red alaea sea salt, ponzu, and wasabi cream, you’ll see that Mainland ain’t any old shop. “Not enough poké shops have specialty musubis!” you’re probably shouting at most times in your life. Though it’s weird that you’re shouting at nobody, Cubed is going to change your mind, with specialty musubis like chicken tonkatsu/pickled radish, egg/bacon/cheese, and jalapeño popper. And, of course, the poké is excellent too (especially the Yuzu Kisu Bowl, with yuzu-marinated salmon, mango salsa, green onions, masago, and edamame over shredded cabbage). 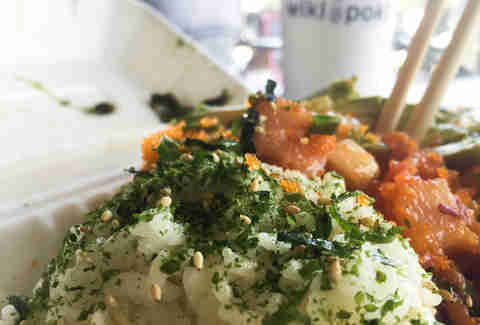 PokiNometry is sure to be your favorite subject once you get in on the sorcery that’s happening on these hallowed grounds: if you’re not feeling white and brown rice you can pile your fishie goodies (which include free scoops of crab meat and avocado) on green salad, chips, and even get it all in a wrap. Culver City’s newest Korean BBQ spot from the chef behind Seoul Sausage Co. has more than just Korean food on the lunch menu. Hanjip’s singular poké bowl not only comes with incredibly fresh tuna, but also with ikura, something you won’t be able to find at any of the other poké shops in LA. And for $15 you can get a lunch combo going, with poké and your choice of KBBQ meat to throw on the grill. Sweetfin’s fish quality is next-level, and they’re also one of the only spots in town to boast snapper as a fish option. Base options include unusual choices like cucumber/kelp slaw and bamboo rice, which you can use for custom bowls or specialties like the Kale Snapper bowl (snapper, classic sauce, kale, napa cabbage, and red onion), which totally goes great with a glass of homemade iced tea and a bag of furikake popcorn. 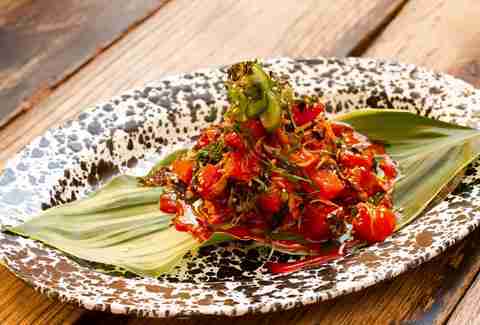 Wilder Shaw is a regular Thrillist contributor who struggles to not eat poké every single day. Holler at him on Instagram at @wildershaw and Twitter at @WilderShaw_.